This excerpt is taken from Ted Widmer’s Brown: The History of an Idea, “Brown Begins,” Chapter 1, released on May 7, 2015, in conjunction with Brown’s 250th Anniversary. … While a number of locations for the college were proposed — another place in Bristol County, or East Greenwich — the question soon turned into a contest between Rhode Island’s two principal towns. For some time, the rivalry between Newport and Providence had flavored local politics, with clan-based struggles over legislation pitting Providence and Newport families against one another. But Providence was coming up very quickly at precisely this moment. Whether one studies the old court records, the architectural legacy, or fictional accounts such as H. P. Lovecraft’s The Case of Charles Dexter Ward, one senses a city teeming with energy, new wealth, and ideas. Indeed, the American Revolution would soon confirm that Providence, not Newport, was Rhode Island’s center of resistance to the British Crown. 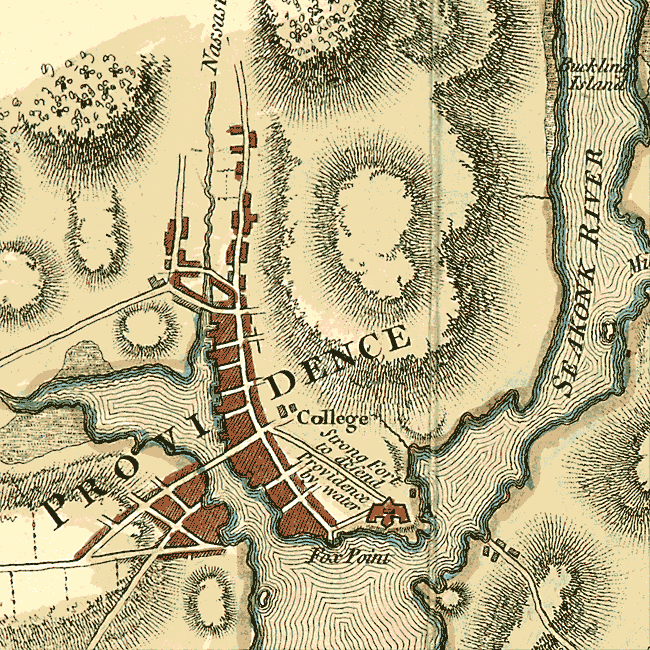 Providence, not Newport, was Rhode Island’s center of resistance to the British Crown. This map is excerpted from the larger map below. 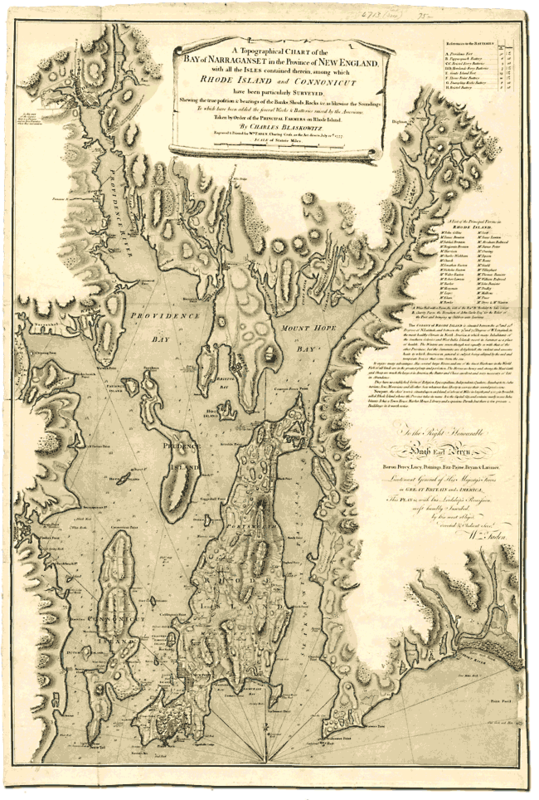 It was drawn by a British military surveyor, Charles Blaskowitz, and published in London in 1777. The excerpted section includes the identification of "College" which is believed to be the first and therefore, earliest representation of Brown University on any map. The meeting that finally decided the issue was held February 8, 1770, at Warren. Stephen Hopkins made the closing argument for Providence, and the Browns were out in force, lobbying and helping to sweeten the financial offer. The amounts raised by Newport and Providence were similar — but also hard to measure, for each side was indulging in creative math, counting pledges and hints of pledges to come.87 Isaac Backus wrote in his diary, “Both sides shewed such indecent heats and hard reflections as I never saw before among men of so much sense as they, and hope I never shall again.”88 But finally it came down to a vote, and Providence prevailed, 21–14. It would never be the same city again. The Browns had done their work well. The Publication Brown: The History of an Idea, is available exclusively at the Brown Bookstore through Fall 2015 and at national retailers following. Purchase in store, online or call (401-863-3168). 77. Guild, History of Brown University with Illustrative Documents, 177–78. According to Guild, a conversation between a local official named Darius Sessions and Moses Brown was crucial in galvanizing the action of the Browns. For more background, see 175–210. The young Benjamin Franklin called Harvard students “blockheads” in his fourth Silence Dogood letter; see Benjamin Franklin, Writings (New York: Library of America, 1987), 13. 78. Kimball, Pictures of Rhode Island in the Past, 56, 72. 79. Hedges, The Browns of Providence Plantations: Colonial Years, 6, 10. 80. Ibid., 15, 123. This iron would be useful during the American Revolution, when it was used for cannons. 87. Guild, citing Manning, in his Historical Sketch of Brown University, calculated the amounts as £4,280 raised by Providence, £4,000 raised by Newport (125). 88. Backus, The Diary of Isaac Backus, 2:770.